The new drummer, Kenny Hyslop, would record late night radio stations and play the tapes on the tour bus. One tape of funk band on a late night New York radio show caught everyone's imagination, and the main riff for Promised You A Miracle was developed. Whilst rehearsing at Rockfield for the second leg of the Sons And Fascination tour, the band kept toying with the idea. They decided, on the spur of the moment, to record it and release it as a single. Producer Pete Walsh was called in to oversee the production. The band were impressed with his remix of Sweat In Bullet for the previous Virgin single. Malcolm Garrett's heraldic fonts, celtic crosses and heart logos perfectly anticipated the look of New Gold Dream (81,82,83,84) which was still many months away. Virgin were left with the slight problem of fleshing out the B-sides as nothing new was available. So the opening instrumental from Sister Feelings Call was pushed into service as a B-side, whilst Ian Caple created an etherial remix from an instrumental version of Seeing Out The Angel. It was the first Simple Minds single to break the top 20, ending up at number 13, ushering in appearances on Top Of The Pops and interviews in teenie pop-magazines. Collectors should also search out the initial German edition in its drab black and white sleeve. Subsequent pressings were issued in the same sleeve as the UK's. After signing to A&M, their new US record company decided to wait until the band started to tour in April 1983 before releasing any material. 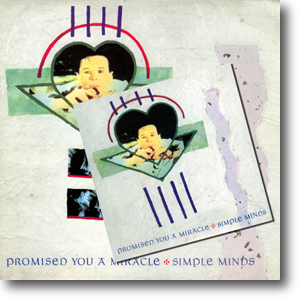 Promised You A Miracle was chosen as the first single, but it shared very little with its European counterpart; the track-listing and artwork was completely different. The title track was paired up with The American as the B-side. Steve Thompson remixed the title track for the 12", an empty sounding, sparse reworking that Jim disliked. Dubs and Special Extended Remixes turned up as B-sides across the 12" and promotional singles. The new artwork, prepared by A&M's in-house designer Lynn Robb was a dreadful reinterpretation of the original sleeve. Ironically this makes it highly prized by collectors.